Please watch the undercover video by Animal Equality – warning very distressing. During a two-year long undercover investigation, which included a total of 72 farms and 4 slaughterhouses, it was found that rabbits were killed by blunt force trauma, farmers were observed killing rabbits by hitting them with iron bars, smashing their heads on concrete floors and punching them. 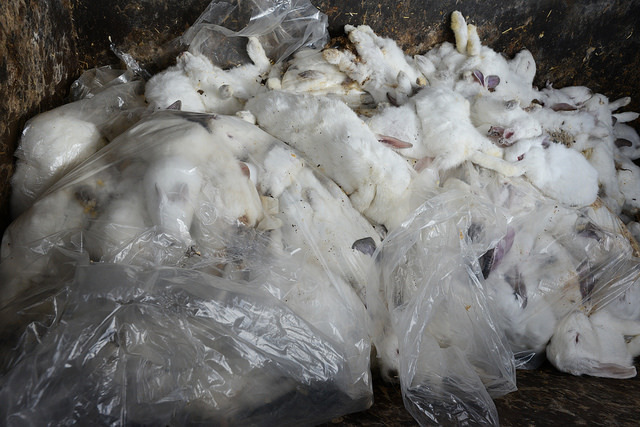 Rabbits, including new born undersized babies, were thrown onto concrete floors and both babies and injured rabbits were thrown live into garbage containers left to die slowly from starvation. Sick and injured rabbits with seriously infected wounds were left in tiny cages in their own faeces without veterinary care. Many rabbits cramped into tiny cages bit and fought each other as a result of stress. Shockingly in the above video one vet boasts of animal cruelty while smashing a helpless rabbit on the concrete ground leaving him twitching and writhing in agony. Dead animals are left in cages with live rabbits and rabbits have their throats cut whilst still alive. Read more and please sign the form letter if you have not already done so. It is possible to edit this and use your own words, but if for some reason you cannot do this send it as it is. It is more effective to edit but not everyone can do this. Two of the farms investigated are linked to the English distributor C&D Wines, and the meat was served at English restaurants. Each year in Europe an astonishing number of rabbits – 332 million – are slaughtered mainly in France, Italy and Spain. Doesn’t that shock you, 332 million , about the population of the USA in 2006 , living sentient beings kept in shocking conditions and slaughtered to provide you with a food that you really do not need and is not natural. Rabbits have a brain and nervous system and feel pain and suffer as you or I. In fact it is known that rabbits are particularly sensitive to pain. They also experience stress and fear, so sensitive are these gentle timid creatures that a rabbit will scream in fear and may have a heart attack. Moreover like all creatures rabbits simply want to live. When I mentioned the terrible cruelty that was taking place on Spanish rabbit farms my husband immediately assumed I was speaking about farms in China. Yes indeed we cannot imagine such atrocities taking place within an EU country, a country which we assume is more ethically progressive than most, after all a law was passed in the Spanish Parliament granting human rights to apes the first, and as far as I know, only legislation of its kind anywhere in the world. 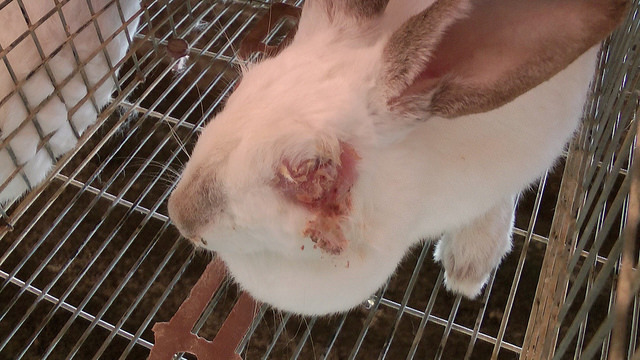 Yet seemingly nothing is done to ensure rabbits are treated humanely. Under no circumstances, anywhere in any part of the world can such hideous cruelty be justified. Such shocking callous cruelty to sentient creatures who feel pain, experience fear and suffer just like you or I is morally wrong and cannot be ignored. Rabbits suffer pain just like your cat or dog, yet often rabbits are not regarded in the same way when it comes to abuse. To say I’m shocked in the extreme to find such atrocities taking place on Spanish farms is no exaggeration. To reiterate, rabbits were beaten, left to die in agony cramped in tiny cages in their own excrement, left to suffer the ravages of disease in awful pain and fear and… well I could go on the level of abuse is unbelievable. Shocking, just shocking, how anyone can treat animals so cruelly is incomprehensible to me. What does this treatment of helpless rabbits say about Spain? 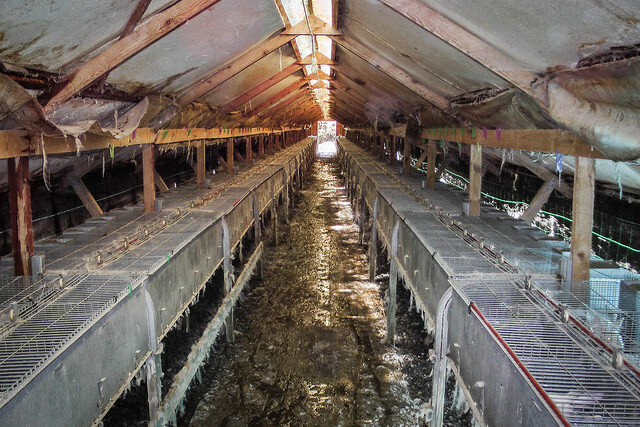 Urge the Spanish government to investigate rabbit farms and stop this shocking cruelly. I am certain there are laws in the EU that prohibit this kind of abuse so please take action to end this suffering for these defenceless animals. I am a vegan and do not eat or use animal derivatives so do not condone the exploitation of animals in the way. The way to stop this and similar atrocities is to stop eating meat. However in the meantime until the human race develops compassion and respect for the right of life to all beings we need to tirelessly campaign for the banning of such cruelty and the closing down of such places of torment which are not worth of any country which wishes to make ethical progress. In the short-term stiffer sentences need to be applied such as incarceration, fines I feel are not much of a deterrent in the long-term. I hope that one day animals will be left to live their lives as nature intended free from exploitation and negative interference by human beings. This comes as no surprise. Under the coalition government social progress has been set back decades. The welfare system is well on the road to destruction as is the free NHS. People are poor not only as a result of rising prices, unemployment and low wages but also as a result of the vicious welfare reforms which have left people with less income, and in some cases no income at all and seen the introduction of exploitative schemes such as workfare and benefit sanctions. One of the most severely effected groups are young unemployed people between the ages of 18 to 25. In the above statistics researchers factored in what would happen if a household was faced with a sudden unexpected expense, at which point more than 40% risked poverty. This is the crux of the matter while some, though increasingly few – I mean who can live on nothing – struggle on the meagre incomes provided by greedy employers and begrudging benefits doled out by the government in what remains of the welfare system when something major comes along you know you are poor. For instance if your roof needs fixing or your boiler needs replacing. On the low earnings and miniscule benefits how the hell does anyone find over £3000 for a boiler – nearly half of the annual income of a single pensioner? How the hell does anyone on £72.40 per week job seekers – or £57.35 if under 24 or £72 for a lone parent over 18 – afford to live never mind repair their home, pay their mortgage/rent or replace an essential such as a boiler? A couple over eighteen get only £113.70 JSA per week and a single pensioner on a basic pension gets £113.10 per week, how on earth can these people survive on such a puny amount, how can they be expected to pay rent, council tax, food, clothing, heating and repairs? Of course we are one of the poorest EU nations. As the divide between rich and poor opens into an ever more widening gap things can only get worse. According to the Huffington Post article Britain as a whole has an average income of £23,300 – ahead of the EU average of £20,750. However, this figure is massively distorted by incomes in Central London, where the average person is on a staggering £71,000 a year. Not mentioned in the article but should be considered, British pensioners on a basic state pension have about £7,000 a year to live on. Averages are very deceptive and the above shows the huge disproportion of wealth here in the UK. So why the hell are we tolerating this deplorable state of affairs? I don’t know about you but I am sick and tired of hearing the phrase heard “working people”. Yes people work hard all right, bloody hard in fact, long hours for low wages but little financial reward it seems. People in the twenty-first century should no longer be wasting their precious lives slaving away on subsistence wages for huge swaths of their time. It has been estimated that no one need work more than fifteen hours each week. After all with the arrival of automation and so many people to do all the necessary work there should be more leisure time. But this will never happen while we cling to the currupt immoral and unfair capitalist system of greed and exploitation of the many by the few. When are we going to say enough is enough? When you find that when you retire you have no pension; when you are sick and thrown out onto the streets to starve because the welfare system exists no more or when you die of a curable or preventable disease because you cannot afford medical care as millions do worldwide. But by than it may be too late, the progress of the last sixty years will be gone for good, destroyed by the over privileged in our society who are driven by an insatiable and pathological greed who think they are better than the rest of us and deserve more for, in many cases, doing significantly less. There is a proposal from Natural England , a public body that advises the government on the natural environment, to permit the killing of Robins and the removal and destruction of their nests and eggs. It also proposes similar action against pied wagtails, starlings, greylag geese and mallards. In Essence Natural England are proposing that it will be permissible for the nests and eggs of these wild birds to be destroyed without the granting of special licences. If you look carefully into the matter you will see that anyone will have the right to kill these wild birds and destroy their nests and eggs when and wherever: These birds will no longer be protected. 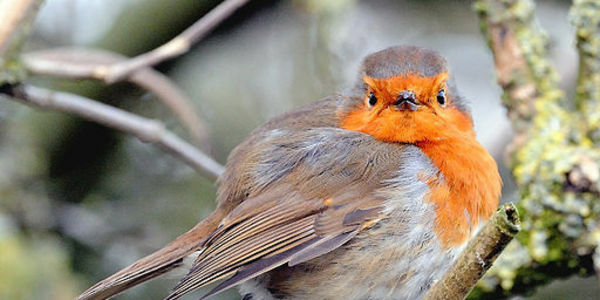 How does the killing of robins and other birds improve the natural environment? As you will see further down there may be more to this than meets the eye. Before continuing please take the following actions. Some of these bird numbers are already in decline and we shouldn’t be worsening their situation. This is another example of humans thinking they can do what they want to the natural world for their own interests. We can’t just decide to upset nature for some people’s narrow-minded opinions and this body that advises the government is not one that has nature’s interests at heart. Stop Natural England from giving people the right to kill robins and destroy their nests and eggs. “Natural England is proposing that robins and other birds in England can be killed and their nests and their eggs destroyed. We must stop this proposal now! Whatever next you might ask. The slaughter of badgers, a protected species, and now the killing of wild birds. Yes the killing of robins and other birds is not quite the same as the organised cull (killing) of badgers, however it is yet again another example of human interference with nature and the right of animals to live their lives as nature intended. What right have we to kill other animals whom we deem inconvenient. This is so outrageous. Birds like all animals are a part of this world as are you and I and should be left alone. The killing of animals deemed a nuisance is of course nothing new. Mao did not however calculate the effect the wanton killing of these creatures would have until the following year when rice crops failed. Apparently Mao had overlooked the fact that the sparrows fed upon the insects that otherwise spoiled the rice crops. The killing campaign was therefore abandoned. So you see killing wildlife may have an unexpected rebound effect as all animals are connected, all occupy a niche in the eco-system. Therefore such interference with nature is unethical not only because it is wrong to kill the other creatures with whom we share this world simply because they ‘re inconvenient, but doing so adversely effects the balance of nature. Humans are destructive creatures are we not. We can’t kill every animal because we think they’re an inconvenience. Many creatures are labelled vermin and people use this word to excuse killing them, often doing so without much thought. What does the word vermin mean anyway, why is one animal assigned the status of vermin while others are not. According to wikipedia vermin are pests or nuisance animals, especially those that threaten human society by spreading diseases or destroying crops and livestock. Well that says it all of course, if any animal is deemed a treat or inconvenience they are classed as vermin, an ugly word by association which is applied to a large number of creatures who are simply living their lives as nature intended. Frankly the greatest pest/vermin on the planet is of course human beings – concerning the spread of disease man is right up there in front. All animals spread disease even your cat or dog. 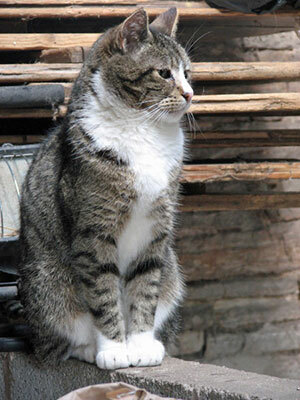 However, humans excel in this respect as they spread disease deliberately. Back in the 1950s rabbits were purposely infected with myxamatosis, an awful lingering and painful death. During that time the countryside was littered with dead and dying rabbits. The health and safety excuse for killing wild birds referred to earlier is rather weak. …what is one of the biggest problems facing property developers when they attempt to develop brownfield sites for residential housing? Looks like it is business as usual for the Tories, yet again a proposal that is all about greed and profit for the few at the expense of the many including wild birds. Don’t let them get away with it. Please take the actions above. Below is a guest blog by Luis Leonel an animal rights activist – warning the videos included are extremely disturbing. I’ve always said that if an alien civilization were discovered and humans could dominate them, the creatures would be murdered, eaten, exhibited in circuses or zoos, and dissected dead or alive, in the same way some people do with animals. “Unnecessary Fuss” is a film produced by Ingrid Newkirk and Alex Pacheco, founders of People for the Ethical Treatment of Animals (PETA), showing footage shot in the period 1983 to 1984 by researchers from the Head Injury Clinic, a laboratory at University of Pennsylvania in Philadelphia, as they caused brain damage on baboons with a hydraulic device while laughing, smoking and playing loud music. After the film was distributed to Congress and news media, the Office for Protection from Research Risks conducted an investigation which found serious violations of the Guide for Care and Use of Laboratory Animals in the clinic. As a consequence of the case, and due mainly to the publicity, the Head Injury Clinic was closed down, the university’s chief veterinarian fired and the university placed on probation. The exposé led the U.S. government to cut off all funding for the experiments. Just a few of the many societies and organisations that help stop vivisection(animal experimentation), there are many others in most countries. In a just society, there is no need for charity. Treblinka was an extermination camp built by Nazi Germany in occupied Poland during World War 11. In a just world the only interference in the lives of animals would be for their well being entirely, such as medical care and other assistance. Health care should be forthcoming to all creatures that need it including of course human beings. However until a more just society prevails and I am not holding my breath, charities including sanctuaries are a vital lifeline to abused animals. Sadly with increasing frequency sanctuaries here in the UK are struggling to survive. Every so often I will focus on one such sanctuary here and ask for your help and support. Today I would like you to help The Farm Animal Sanctuary to avoid eviction. The Farm Animal Sanctuary is a place of refuge for over 500 animals including birds who have been rescued from abuse, neglect, slaughter and abandonment. You can read more about the sanctuary and some of its residents on their home page and throughout the website. All farm animals are sentient beings, they experience pain and fear, all species are caring, protective mothers and they all deserve so much better. It’s such a joy to see the animals who have found their way to the Sanctuary. They know they are safe. They look contented, confident and peaceful, the young ones so full of life. Not enough people seem to care about them, and there are not enough places for them to go. We do need your help and your support to keep the Sanctuary going, please don’t forget them. Thank you. Please help save The Farm Animal Sanctuary to continue caring for neglected and abused animals. You can help today in a number of ways – not all of them require a monetary donation – by clicking the following links for more information. http://www.thefarmanimalsanctuary.co.uk/index.php – scroll down for information how to help the Sanctuary to avoid eviction. Also please help by supporting Emily and Finlay Dankworth who are running for the Sanctuary on Sunday1st June because “They don’t want the Sanctuary to be evicted,” says Emily. They are running a 5K Colour Run which means for every K marker they pass they will be covered in multi-coloured paint! Emily has a fund raising page for this event on Just Giving; please support her and Finlay’s effort. Ways to help if you cannot give money. You can also spread the word on Twitter, in blogs as I am doing now, forums and so on. Farm animals are global. They are not endangered, exotic or wild. They are animals who are born and raised for their meat and milk, and throughout the world very often do this with a minimum of care. Care costs time and money, and they’re not considered to be worth either. They are just another product, although unlike other food products such as grains, fruits and vegetables, they bleed when they are injured. They die from fear and stress. They suffer distress when their young are taken away from them. They can be kept until they are too old to stand as long as they can still produce milk or offspring. They can then be travelled hundreds of miles, enduring awful conditions, to be slaughtered without pre-stunning. There are very few places throughout the world where farm animals can find sanctuary to be able to live out their lives in peace, to be treated with kindness and respect. We watch these animals become comfortable and confident. We see their characters develop. We admire their intelligence and the way they embrace their peaceful surroundings. We watch them begin to play and finally become content. I know that many of the links I have included are easily accessible from Farm Sanctuary’s website but the fact is most people seem to overlook them. Please do whatever you can large or small every action is needed, every action counts. Conservative think-tank Bright Blue has recommended that a pledge for the partial legalisation of cannabis should be included in the Tory’s general election manifesto. The new proposals by Bright Blue suggest that drug reform would appeal to young and ethnic-minority voters, who are crucial to the Conservative Party’s long-term survival, while saving millions of pounds of public money. While I unreservedly welcome the legalisation of cannabis I would never vote Tory to bring it about. This is of course an obvious ploy to win votes from younger people who tend not to vote and is therefore nothing more than devious manipulation of the electorate. This, if included in the manifesto, will in any case be another broken election promise; the Tory’s will never legalise cannabis because it would adversely effect the right-wing conservative vote. Before you vote on a one-policy issue, this or any other, remember the devastation of misery the Tory’s have inflicted on almost everyone except the very rich. Here is a graphic reminder from Flickr user Byzantine_K of the effects of Tory policy during the last four years. 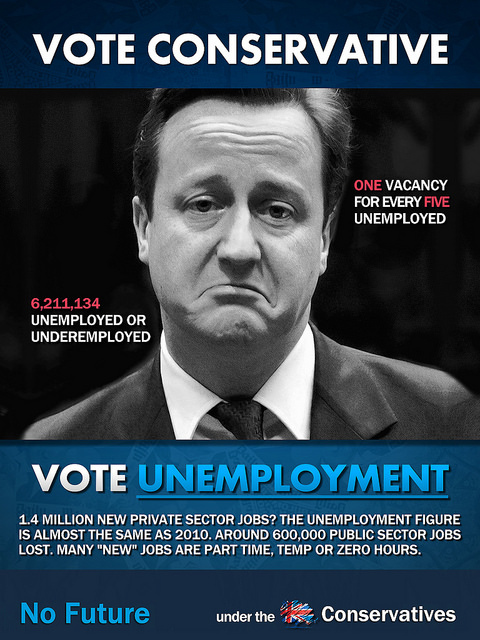 The conservatives have created unemployment. One vacancy for every five job applicants and zero working hours, which basically means that a person is counted as employed but may in fact not be working at all. Also People on Workfare placements are counted as “employed” in government statistics. Vicious welfare reforms (benefit cuts)have plunged thousands of people into devastating poverty, including the sick and disabled, driven thousands to commit suicide and left many with insufficient or no income dependant on food banks, shivering in unheated homes. These drastic and unfair cuts range from reduction in amount received to a complete cessation of benefits when seriously sick and severely disabled people are told they are fit for work and have their benefits stopped. These cuts include the bedroom tax which since it’s introduction has plunged many deeper into poverty and resulted in an increase in homelessness. 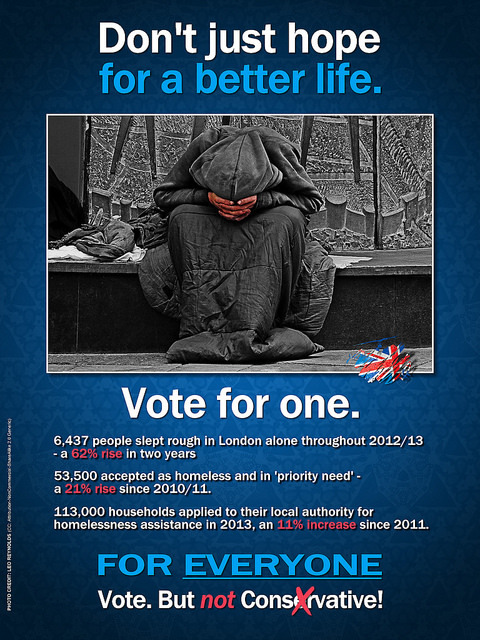 In modern-day UK 13 million people live below the poverty line. Real unemployment has risen, and the Conservatives method for supposedly tackling the crisis is to take advantage of the situation and provide themselves and their wealthy friends with a growing supply of free workers. Capitalism – and certainly at its extreme; that which we are now enduring – does not work accept for the greed of the few. The government is whittling welfare away to nothing, destroying employee protections in order to make it easier for employers to hire and fire; to generally exploit and mistreat their employees. Work continues to vanish overseas where people can be even more easily and grossly exploited, and more jobs are lost to private and public sector job cuts motivated more by greed than neccessity. And how many 10s of thousands of jobs have been lost to such as the automated/self-service checkouts? Last month began the government’s latest work-for-nothing Workfare scheme Help To Work, which includes the Community Work Placements programme that requires anyone who has been unemployed for over two years to carry out 780 hours of unpaid “voluntary work” – a real oxymoron if ever there was one. Community Work Placements are six-month unpaid work placements for unemployed people, part a set measures branded as “Help to Work”. The £300 million Help to Work programme is aimed at 200,000 Jobseekers Allowance claimants. Studies into existing UK workfare schemes in the UK have found them to have zero effect on helping people find work. http://www.boycottworkfare.org/?p=3543 – please take the suggested action to help the Keep Volunteering Voluntary campaign. 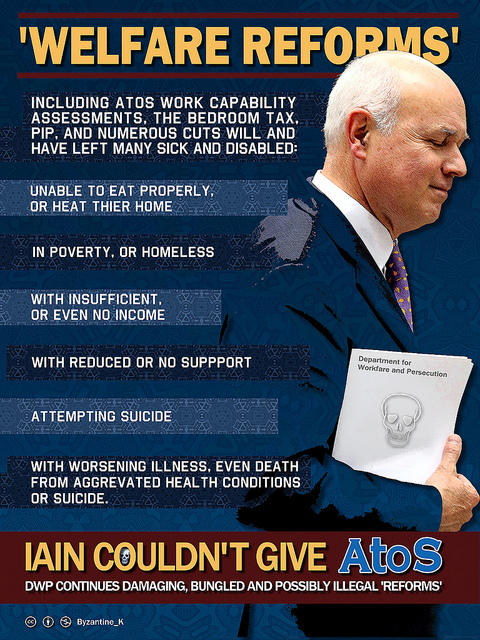 Workfare – work for nothing schemes. Failure to comply will result in sanctions from a minimum of four weeks to as much as three years! …the dubious “economic crisis” followed unhelpfully by a swathe of vicious and unjustifiable cuts and so-called reforms by this phony government, plus uncontrolled and often greed driven prices rises and sinking wages has caused poverty to soar to levels unknown since the War, and a dramatic increase in homelessness nationwide. And it needs to be remembered that many of the homeless go unrecorded Homelessness is nothing new – and in more recent time was noticeably bad during the 1980’s and into the 1990’s in the UK. The situation seemed to improve for a while following. The world’s largest tax cut to bankers. 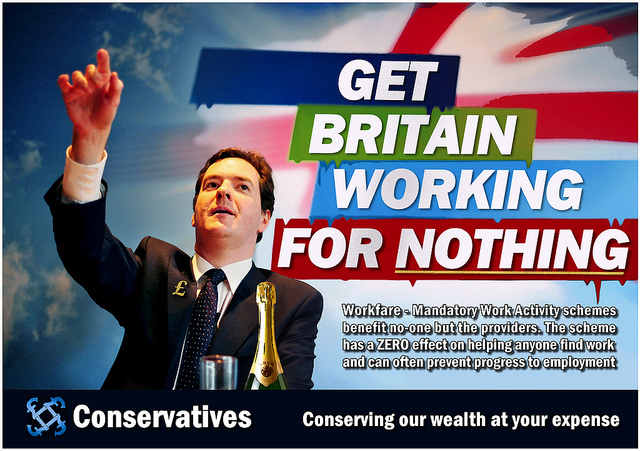 Osborne also spent thousands of the tax payers money fighting an EU ban on bankers’ bonuses. Tax cuts to the rich and corporations. Also profit motivated NHS reforms, privatisation of the post office below it’s value and increased funding for councils – but only in affluent areas. We can’t go on with this government. If they remain in office much longer, little if anything will be left of what was once good about this country. If you vote conservative based on the promise of the legalisation of cannabis or a vote on the EU you are also voting for more of the above. Ask yourself, is it really worth another five years of rule under this vile government who have destroyed millions of lives reducing people to poverty levels not seen this side of world war 2 while feathering the nests of the rich and the elite. Click the link below for more graphics from Flickr user Byzantine_K . 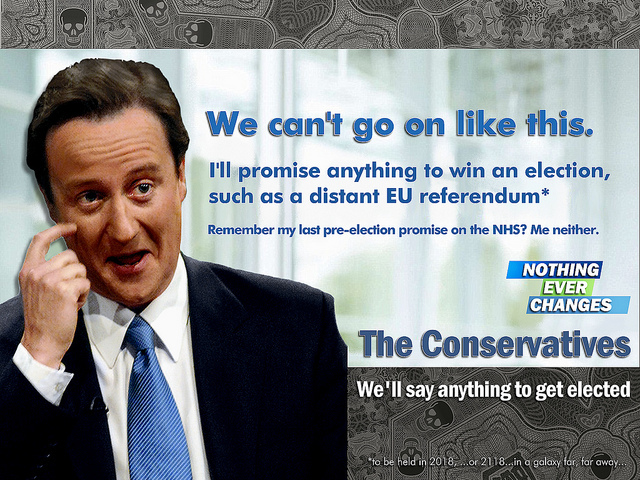 All graphics have a creative commons license, please freely use in anti Tory campaigns during the upcoming election. The public need to be reminded of the devastation and suffering brought about by the most vile, the most callous, the most greedy self-serving and incompetent government in the history of the UK. Do not forget the parasitic Libdems role in the destruction of our welfare system, the NHS and indeed most of the warped Tory policies, all of which, with the exception of Gay marriage, have been a detriment to most of us who are not rich.